The stories that go along with the old pictures of early custom cars are sometimes just as interesting as the cars themselves. 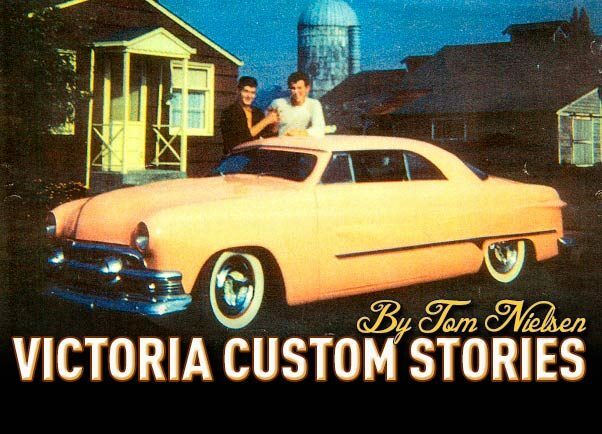 I have tried to put together a collection of ’49-‘51 Ford hardtop convertibles, with chopped Victoria tops, and the stories that go with the pictures. I hope the readers will agree that the Ford Victoria’s unique looks gave rise to some “cool” customs and interesting stories. 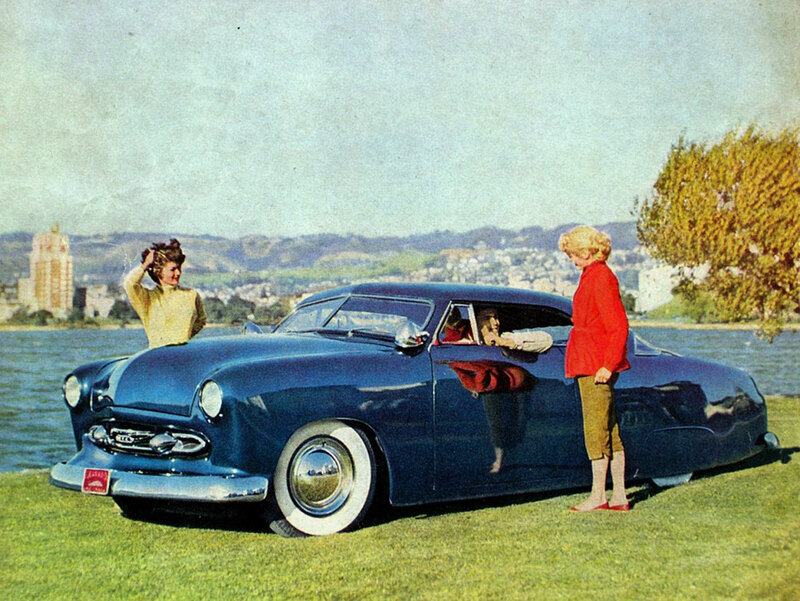 By 1951 Ford’s shoebox body style was entering its third year of production. While Ford updated their grilles, taillights and dashboards for 1951, they couldn’t help but notice the popularity of the GM hardtop convertibles in all the GM brands. The Ford Crestliner was an earlier attempt to attract the young at heart seeking a sportier two door. By mid-1951 Ford had decided to come out with a new hardtop convertible. The 1951 Ford convertible was to be the basis for the classy, new Victoria. A steel roof with a curved three-piece rear glass would be welded to the convertible body. Ford’s new hardtop convertible was a big hit with the public and over 110,000 were sold in just half of a year! Since this new model was so popular, it was only natural that the young at heart would personalize this sporty hardtop to suit their tastes. One night in 1959 when young Dan Holms was working at the “Premium Pump” gas station in Renton, Washington a custom car pulled into the station. A one-time viewing left a lasting impression on him. (Us car guys know how strong those early car memories of a special car can be.) 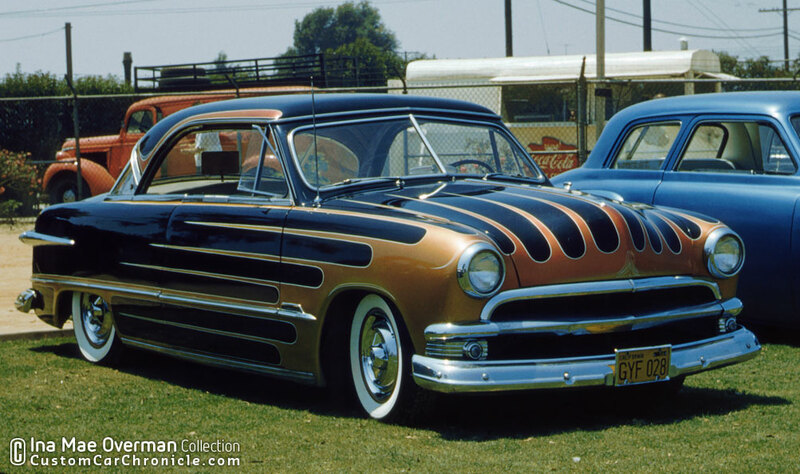 It was a persimmon colored 1951 Ford chopped hardtop with some very tasteful modifications. Someone had added ’54 Ford side trim, frenched the headlights, and nicely dechromed the hood and deck. 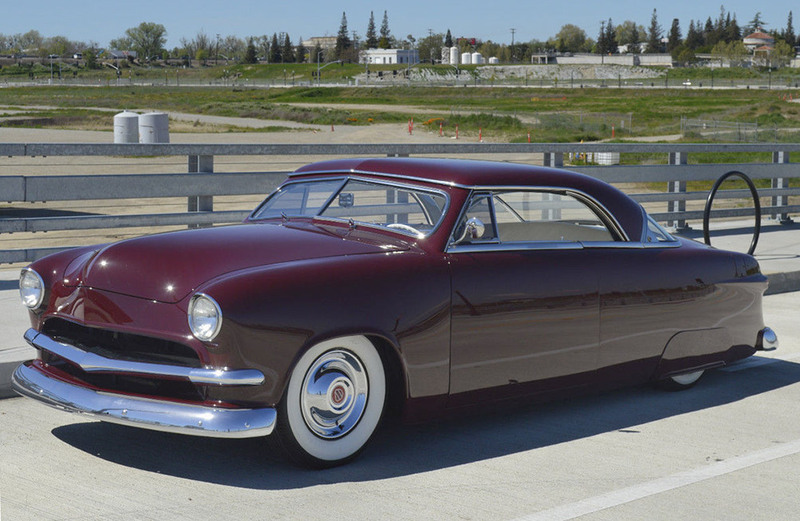 The low Victoria hardtop featured a ’51 Mercury back window that had been slanted to match the new contour of the chopped top. 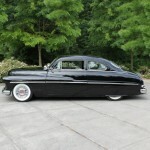 In looking at the side profile the chopped top using the ’51 Merc glass fits very nicely. The bodywork must have been done by a seasoned shop as it has such a great look and everything fits so well. Dan remembers that when the owner, Corky Carrol, opened the hood there was a Ford six cylinder engine in the engine bay. Today that engine adds to the mystique of this cool car even though back then a hot V8 might have been cooler. (Remember the Valley Custom, Ron Dunn sectioned shoebox has a six cylinder engine also.) He checked out the car carefully and remembers that the paint still smelled fresh and the interior was unfinished. Dan was hoping to see it again and find out more about its origin. It only made one appearance and then it was gone, no one knew where it came from and who owned it previously. It was like seeing a “shooting star” and then it was gone! In fact, that was the only time he or anyone he knew ever saw that memorable “persimmon” Victoria! It was wrecked the very next day and never seen again. Years later, a friend of Dan’s named Tom Reano gave Dan a picture of the chopped hardtop. Tom’s brotherr, Bob Reano, is in the picture taken at their house in the Kent valley. Bob very briefly owned the car for several days. Dan was greatful to at least have a picture of the car that he remembered so strongly. 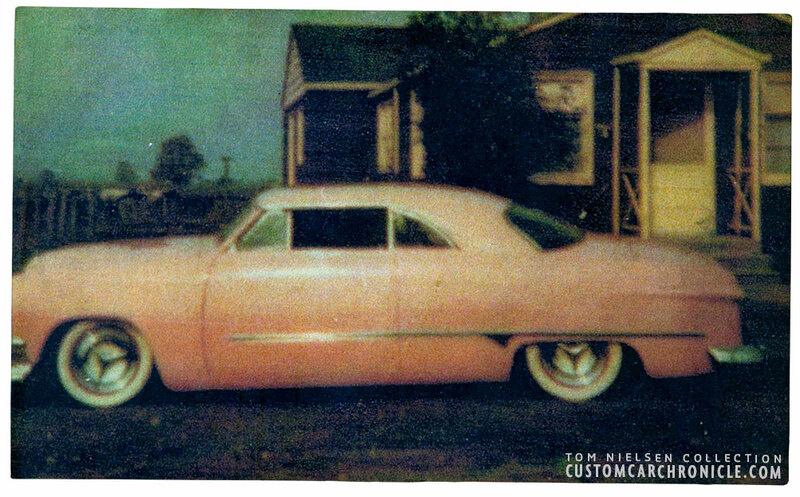 In 2005-6 Mr. Holms decided to run an ad with a picture in Hemmings Motor News, asking if anyone knew anything about the car? The ad ran for over four months and no information on the “Mystery Vicky” turned up! About fifty years after that gas station sighting of the ’51 chopped Victoria in 1959, a very starange thing happened! Dan was at a car show in Renton and bumped into an old car friend named Frank Donafrio. They got to talking and Dan asked Frank if he remembered the chopped ’51 hardtop? Then he showed him the picture that he had received from Tom Reano. There was a short pause and Frank finally replied, “Yes, I remember that car well, I was also working that same night at the Premium Pump in Renton! In fact, I took that picture at the Reano house. 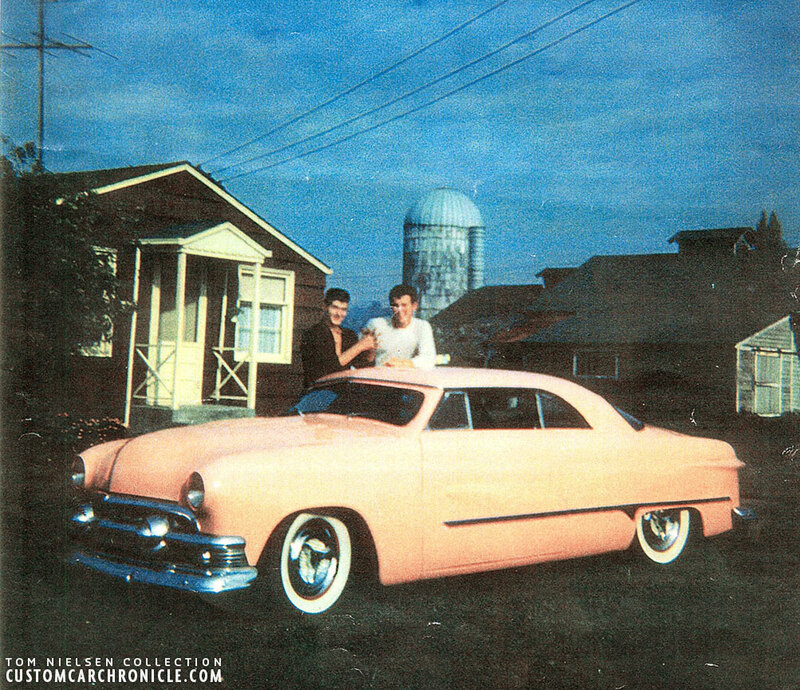 Corky Carrol and Bob Reano standing by the custom Victoria. Bob bought it from Corky and they both owned it very briefly. Then Frank said, “ If you walk out to my car with me I have something to show you”. When they reached his car Frank pulled a picture out of his glovebox. 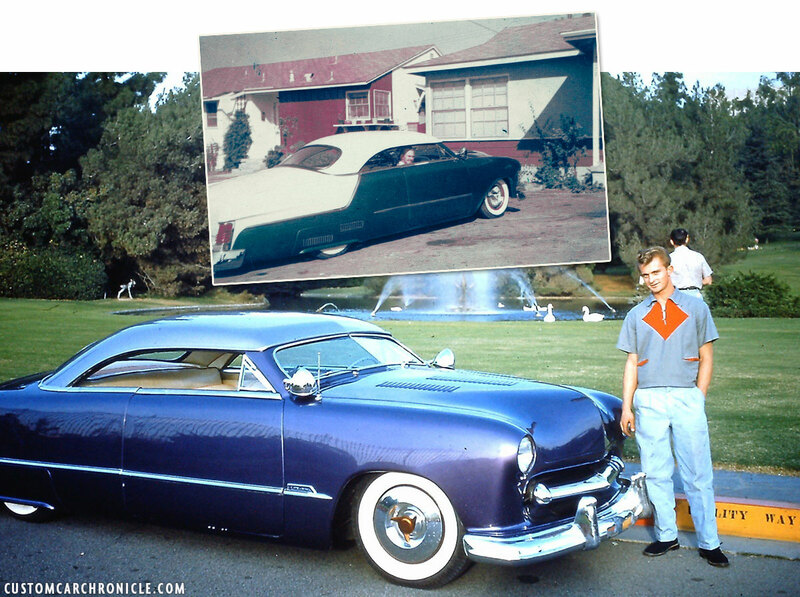 When Dan looked at the picture it showed the same car but from from the rear ¾ angleshowing the ’51 Merc rear window. “Why were you carrying this picture around? “ , Dan aked Frank. “ I came here today hoping to find someone who remembered this car”, Frank replied. Then he went on to tell Dan that he had thought about that car long after last seeing it at the Premium Pump station. Dan was very surprised to find out that he wasn’t the only guy captivated by this unique custom car. The side view shows the unique integration of the ’51 Mercury rear window. After running the ads in Hemmings Dan decided that maybe he would build a copy of the “mysterious” , chopped Victoria. 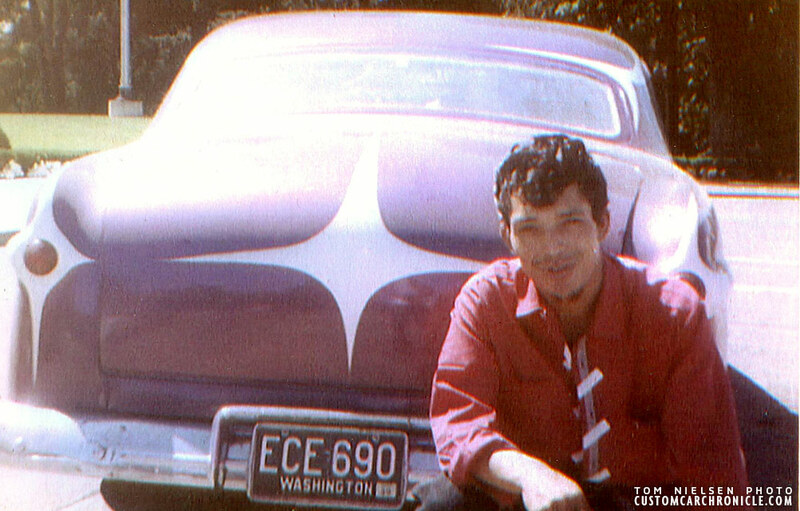 He easily found several ’51 Victorias for sale in the Seattle suburbs around 2006. 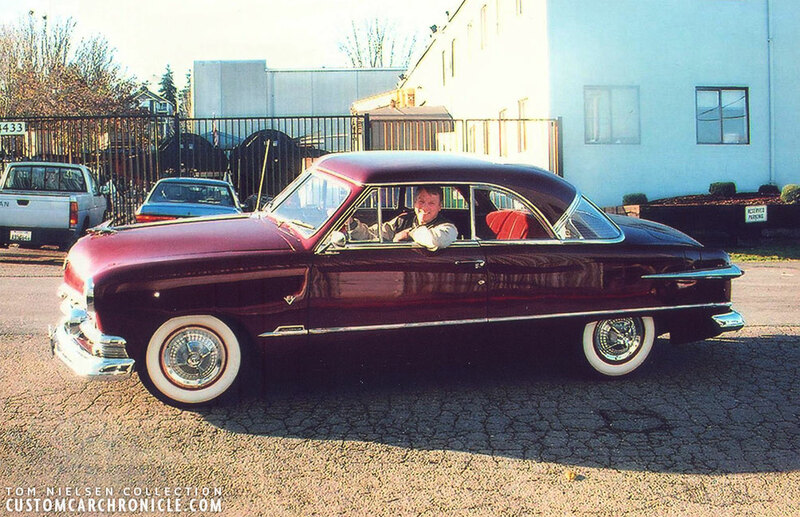 After a brief search a very clean, rust free, original maroon ’51 hardtop with a bad engine was purchased in Burien. Once Dan had the newly purchased car in his shop, he and Randy Ricci began working on getting it to run. The 8BA V8 turned out to only have a stuck valve and needed some degreasing before it ran like a clock. 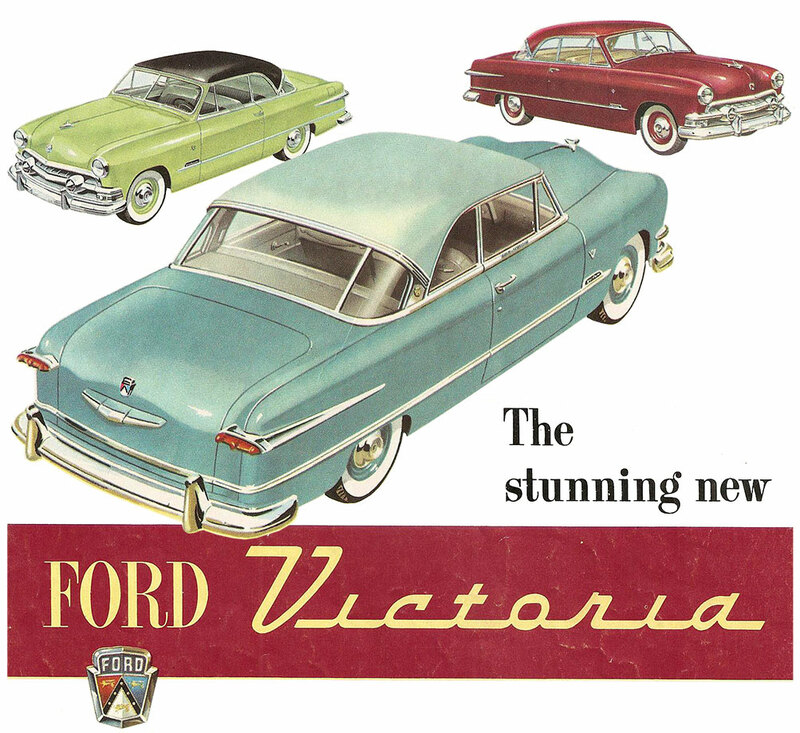 I drove his Victoria several times and it was a nice driving car with Ford’s, new for 1951, automatic transmission. Here I am behind the wheel of the car that was to be transformed into a “clone” of the “Mystery ’51 chopped Victoria. Unfortunately the “cloning” of the mystery custom was slow getting started because Mr. Holms was busy with the re-crafting of another more famous custom car. He was working on the ’56 Chev, ” Car Craft ten best custom”, known as Madame Fi Fi. One day about eleven years ago a man and his wife from Poulsbo, WA were driving around in Seattle. By chance they happened to see the Victoria through an open door in Dan’s shop. The couple explained that they had been looking for a car just like it and wanted it in the worst way. They offered to buy it on the spot.Since it was really a nice original car and there were other projects he was busy with at the time, Dan reluctantly sold it to them. The desire to know more about this cool “persimmon” ’51 Victoria with the ’51 Merc rear window is still there! So if anyone knows anything about it please let us know. Using ’51 tops on the ’49-50 Ford convertibles. I had never paid much attention to earlier shoebox Fords with a hardtop convertible top grafted on the body. 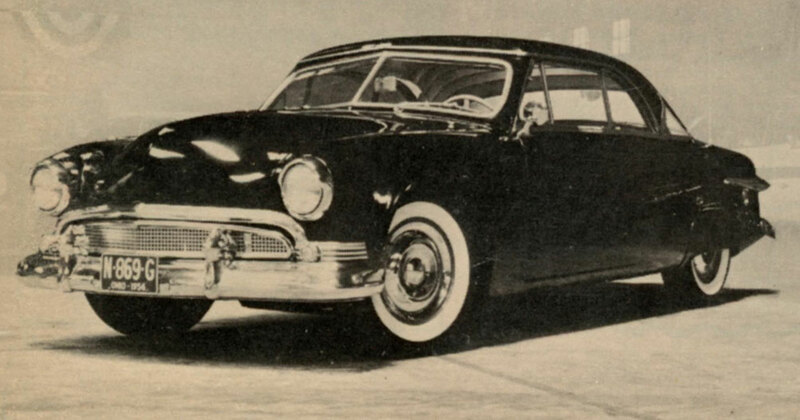 In looking through old magazines and archives I discovered that there were a number of custom ’49 and ’50 Fords that got ’51 Victoria tops welded on them. In some cases just like the factory had done in 1951. If you were building a full custom after chopping the windshield and wing windows you could get a top off of a wrecked ’51 hardtop. When it was chopped you could fit it to the convertible body. Of course the three-piece tempered rear window always presented a challenge. Customizers came up with various ways to put a rear window in the hardtop. One way was to build a plexiglass rear window or to use a rear window from another car. The results proved to be worth the effort and created a desirable custom hardtop. One of the first customs built in this manner belonged to Elton Kantor and was built by Joe Bailon in 1952. Bailon was able to do a complete makeover of this convertible and even hand made the taillights and grille. The rear window was built from plexiglass in three pieces. With its dark metallic blue paint Elton’s car won the Elegance Award at the Oakland Roadster Show in 1953. The smooth sides and sleek profile make this shoebox’s low lines look awesome. The Hop Up Magazine photo with the attractive models and a lake in the background is a “classic picture”. 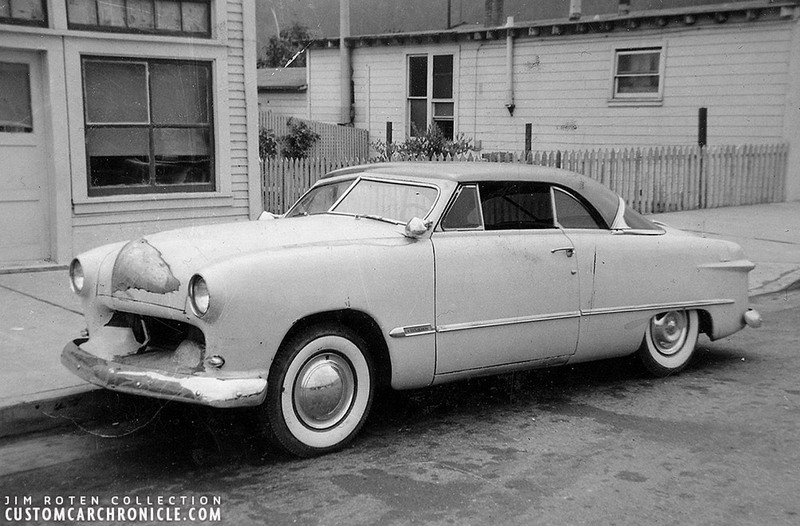 Elton Kantor’s Ford started out as a convertible. Joe Bailon chopped the windshield and added a new roof with plexiglass rear window in the typical Ford Victoria style. The first version of the car was painted dark blue with no side trim for an ultra smooth look. Later Elton had Joe Bailon add modified ’54 Chev side trim and ’54 Chev taillights to give his car an updated appearance. The car was featured in several car magazines in the 1950’s. Another spectacular looking hardtop custom from around 1954 was owned and built by Jay Johnston. It also has a nice low profile and the top flows nicely into the trunk area. A great looking Gaylord interior and a chromed ’51 dash set this hardtop apart and made this car one of the great shoeboxes of that era. Photos in the Rik Hoving Custom Car Archives show that it has a coupe body and the chopped Victoria top was grafted on to it. A rear window from a closed car was fit to the hardtop when it was chopped. 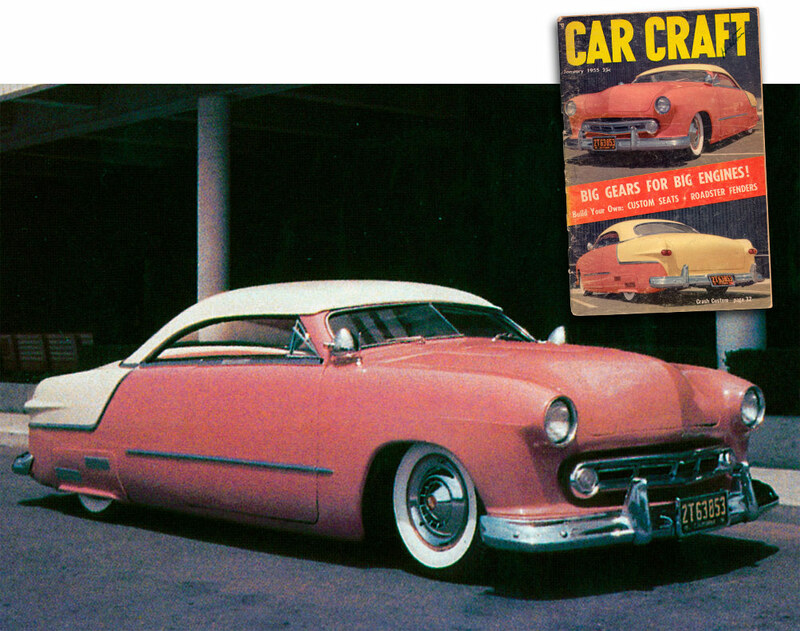 Jay’s car also looked outstanding in two tone as it appears in the cover photo for Car Craft in January 1955 . 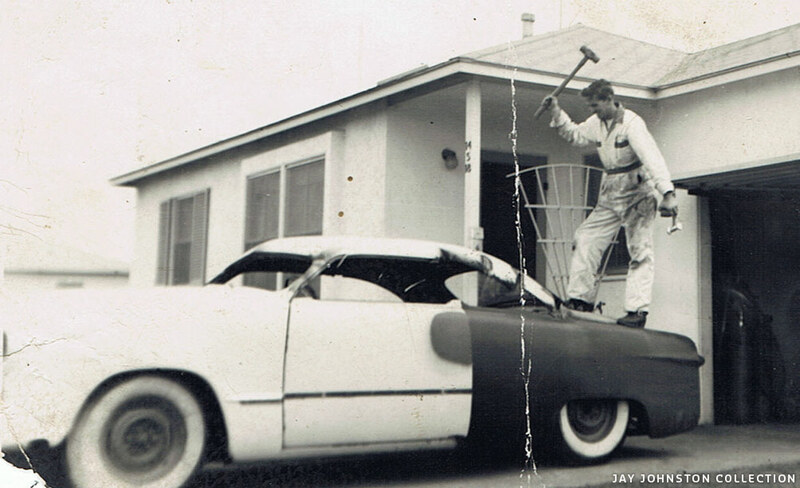 Jay wrecked his custom ’49 Ford Coupe, and bought the remains back from the insurance company. He then collected parts from other cars, including a new roof from a Sedan to create his home made chopped Victoria body. Jay goofing around on his in progress project. This photo shows the coupe doors with cut off window frames, laid back windshield, and hard-topped roof created from a sedan top. The big picture shows the first version in purple and lavender how Jay Johnston finished his home made Ford Victoria. The inset photo shows the last version of the car with new Mercury taillights and new paint. 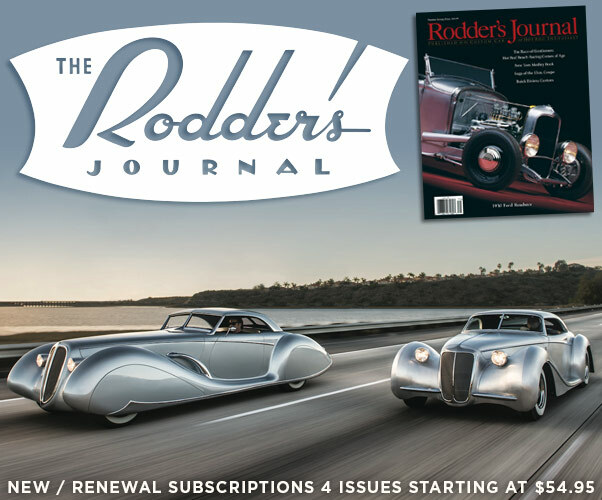 Jay Johnston’s 1949 Ford in its most famous salmon and cream color combo how it appeared on the cover of the January 1955 issue of Car Craft magazine. Unfortunately, not much is known about this abandoned “survivor” ’49 convert with a Victoria top. For a moment I thought that it had been built by Tom Sewell in Yakima and later owned by Frank Maes in Oregon. However, in looking at Franks car the rear window treatment and lack of ’49 trunk hinges show that it is not the same car. Frank’s Ford had been painted and scalloped while at Wescott’s for an update in 1959. The purple and white ‘50 Ford received a respectable third place in “full custom” amid some tough competition at the 1959 Portland Roadster Show. 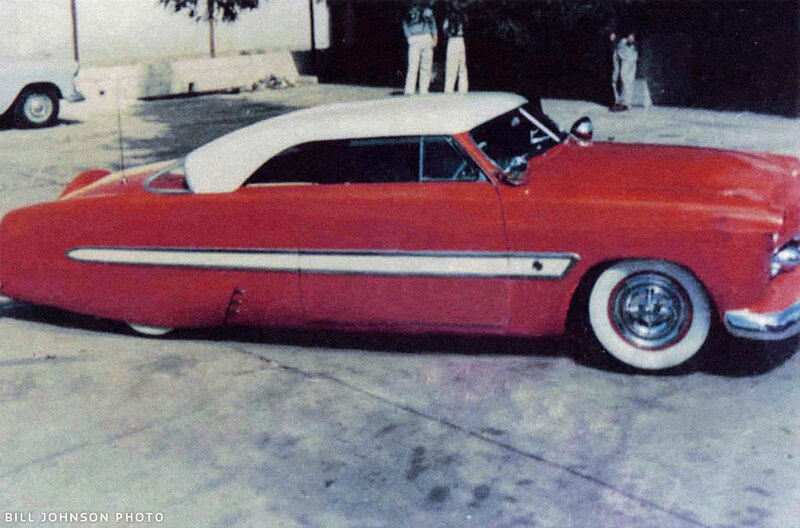 Using a ’51 top on the earlier Ford convertible created this Northwest, “full custom” hardtop. Frank Maes purple ’50 from the back with Frank by his car. The “survivor” ’49 Convertible has been saved from any further deterioration. The body has been straightened and it is currently (May, 2017) in primer. 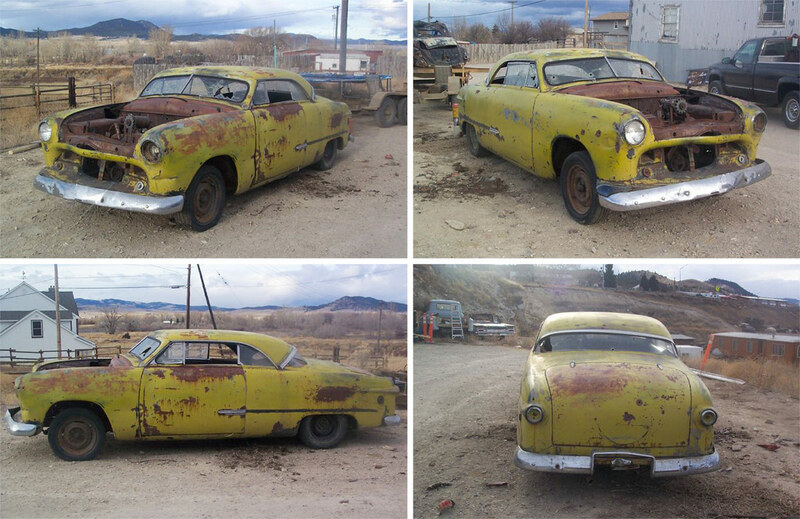 We would like to know more about the history of this Olds powered chopped ’49 Ford. If anyone has any information about this custom I would appreciate hearing about it. 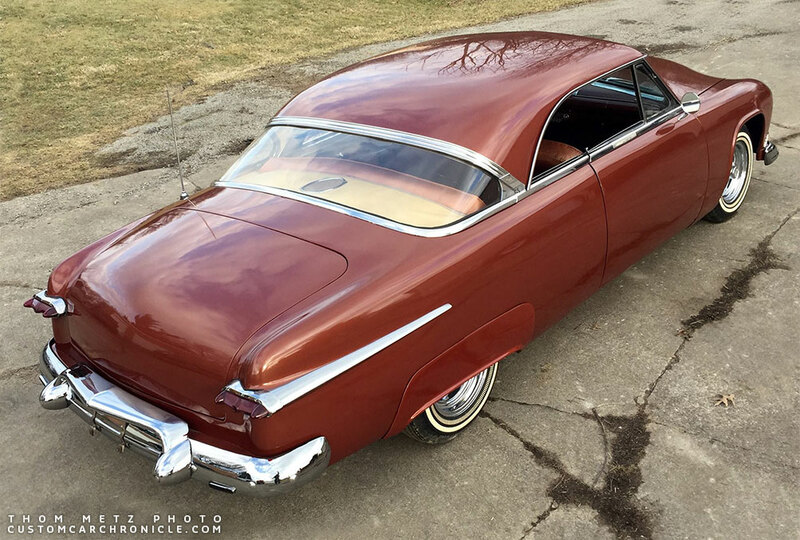 Here is an interesting story of how a custom hardtop was built from a ’49 convertible using parts from both the ’51 Ford Victoria and trim pieces from a 50’s Buick. Rod and Custom told the story pretty well in their November 1954 issue and there is not much that I can add to it. Cotton Woodworth’s ’49 Ford with Vicky top had a full 4 pages in the November 1954 issue of Rod & Custom Magazine. I think this example of a ’49 convertible with a Victoria top looked more like something Buick or Ford could have offered from the factory. It is a very successful blending of different parts to come up with a good looking hardtop convertible. 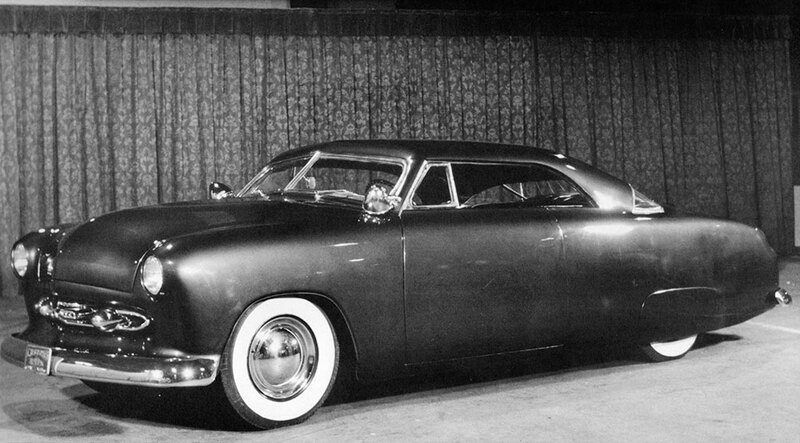 If Ford had offered a car like this in 1951 it would have been real winner in sales! Cotton Woodworth did all the work on his ’49 convertible with a ’51 top in his body shop in Oklahoma City. The end result is a very stylish ample of how great these Victoria’ can look as full custom. Pictured below are several photos from the great Jim Roten collection in the Custom Archives that Rik Hoving maintains. I don’t know anything about the car, but the car appears to be a ’50 Ford that someone grafted a ’51 Victoria hardtop on when it was chopped. I like the “early look” of the car’s front end view. It shows how guys used to drive around with their car while still undergoing customizing. The rear view shot has a wonderful 1950’s background and the car looks finished from this angle. These pictures taken in Northern California almost tell a story just by looking at them. Chopped ’50 hardtop from the Jim Roten Collection. Here is what Jim Roten remembers about his three photos. Ina Mae Overman took a photo of this very nicely done mild Custom ’51 Ford Victoria at an mid 1950’s High School car show. It shows these Victoria’s did not need much to become a really cool car. Shoebox Fords always looked great with a sectioned body, and when Sam Climo added a chopped Victoria top to his sectioned convertible body the result was stunning. Sam Climo’s Ford survived and was recently (2015) uncovered. This photo shows that Sam used a single piece of plexiglass, bended to fit the chopped rear window opening replacing the stock three piece unit. More on Sam’s car can be read in the CCC-Article. Mark Skipper filled in the rear window and used a smaller unit on his chopped Vicky, the Royal Victoria. George Hernandez from Sacramento is the owner of this stunning 51 Ford Vicky with chopped top. The rear window on George his Victoria was done exceptionally well, flowing beautiful into the chopped top. In summary, the addition of the hardtop convertible Victoria to the line of 1951 Fords was a good move on the part of the Ford Motor Company. It updated their three year old body design. The new model also gave lots of new possibilities for the guys who customized their shoeboxes. Wonderful story, Tom. Really gets the juices going. Some very inspiring pieces of work. One sidebar note: That original top was designed by none other than Gordon Buehrig for Ford. He earlier created the 1935-36 Auburn, and the coffin nose Cord, perhaps the most unique of the classic car era. I had not realized that so many convertibles had been converted to hardtops. 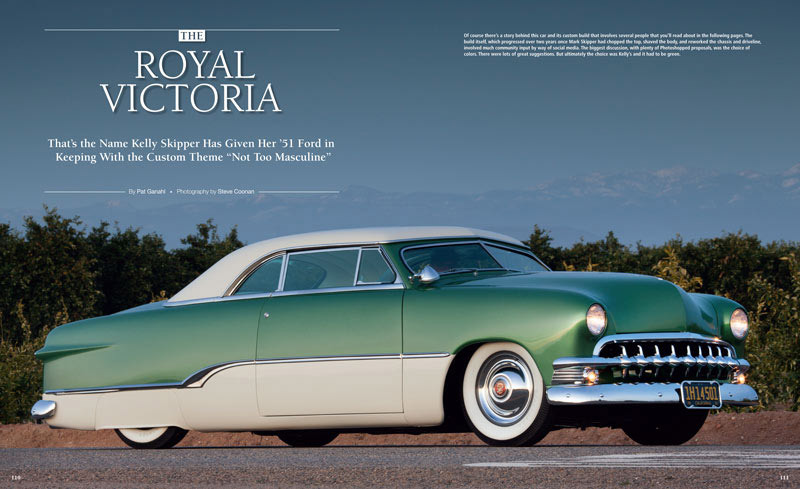 This article really showcases how well a ’51 Victoria can be turned into a stunning kustom…all are prime examples of what is possible. I have never seen pictures or heard of the yellow Vicky with the ’51 Merc rear window, but I really love the look. 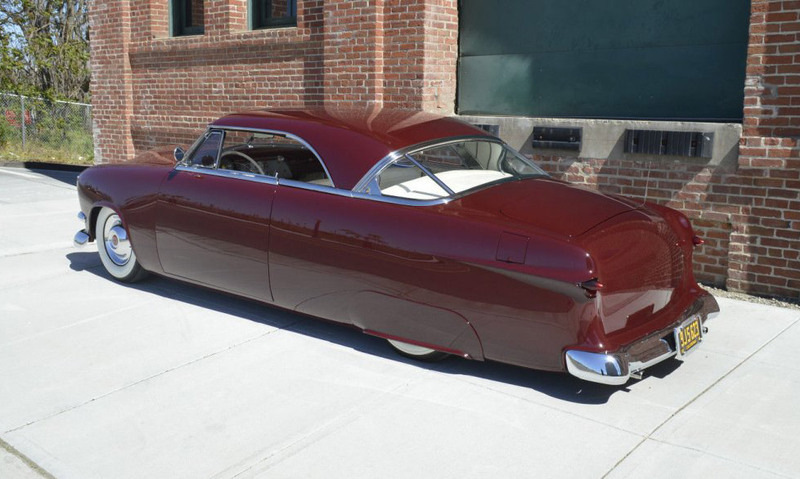 The way the ’54 Ford side trim drops down compliments the shape of the chopped quarter window…a nice touch. It would be interesting to see how the ’51 Merc rear glass fit the Ford body in person- it looks like it was a very close match based on these pictures. My cousin amp just bought George Hernandez custom. It is in a trailer on it way as I type this. Such a beautiful car and I can’t wait to drive it also. Well, the ‘51 Ford “Vicky” showed up from Sacramento this past week and is my first custom. I’ve had oldies and originals, but this Custom tops all of them. I’m so glad I took that big step and bought a Custom. Aloha Custom fans! Congratulations on your new, chopped, Victoria custom. It is a beautiful car and I am sure you will enjoy it.